I took yesterday mostly off from blogging, so today I’m a bit behind and didn’t get these posted this morning like I’d hoped. At any rate, I was really encouraged because I felt like I’d had a really unproductive week. You know, one of those where you just seem to go around and around in circles and accomplish next to nothing? However, when I sat down to assess last week’s goals and make a list for this week, I was encouraged: maybe I didn’t get everything crossed off, but I really did have a pretty productive week! That was encouraging, as well as an extra motivation for continuing to set weekly goals. Since Monday was a holiday and we’re going to be out of town the end of this week, I’m only setting eight goals this week, instead of my usual 10. And in an effort to give myself grace and not be unrealistic, I tried to keep the goals pretty simple this week. That way, I’m not starting out already feeling defeated. I’m all about aiming high, but it’s also important to know your own limitations. 1. Finish reading Homer Price aloud to the children. 2. Continue teaching children table chores. 7. Wash, dry, fold, & put away one load of laundry every day. 8. Re-shoot videos and send to publicist. 9. Start working on my presentation for an upcoming speaking engagement. 10. Meet an acquaintance who asked for counsel regarding her business. 1. Finish reading All of a Kind Family and Squanto, Friend of the Pilgrims aloud to the children. 2. Make a Wigwam and Teepee. 3. Run 9 miles (total). 5. Finish reading What Women Fear, Chasing Daylight, and All the Money in the World. 7. Continue working on my presentation for an upcoming speaking engagement. 8. Write and send letters to our Compassion children. How did you do on last week’s goals? What are your goals for this week? If you feel comfortable doing so, I’d love to have you share your progress on last week’s goals and your goals for this coming week in the comments. Let’s cheer each other on to live purposeful and productive lives! Someone commented on the goals post last week lamenting the fact that she wasn’t able to get many of her goals accomplished since she had a toddler and a newborn. You know what? I wouldn’t be doing much of any of this if I had a toddler and a newborn, either! In fact, it’s hard for me to even remember what those days were like now that my children all sleep consistently through the night, can dress themselves, help with the chores, and are pretty independent. I’m sharing my goals as a way to keep myself accountable and to (hopefully!) inspire you to live life on purpose, instead of just letting the hours and days slip by without intention. However, please do not feel like you need to be accomplishing similar things to what I have on my list. I’m in a relatively easy season of life since my children are 6, 4, and 2 (compared to having them be 4, 1, and newborn, it’s definitely much, much easier! ), so I can challenge myself to do more than I have at other seasons because I’m sleeping at least 6 or 7-hour stretches every single night (this makes a world of difference!) and my children are now at the age where they can help out and play independently instead of needing me to do every single little thing for them each day like they did when they were younger. If you are the mom of very young children who depend upon you for just about everything, make sure and read my post of encouragement to you here. If you accomplish nothing more than keeping everyone fed and diapered and you spend quality time enjoying your children, you are accomplishing a lot! Set microscopic goals and don’t be discouraged if even those don’t get done. Really and truly, it will get easier. Don’t compare yourself to other moms and feel inadequate if you’re not doing as much as them. Give yourself grace, smile, make your own health a priority, and just love on your babies while they are little! You’ll never regret making them a much higher priority than a clean house or a checked-off to-do list. 2. Take children on a Nature Walk. 3. Run 12.5 miles (total). 9. Go through my formatted and edited manuscript from the publisher to check for errors in format or content. 10. Meet with a friend who asked for counsel. 3. Run 13 miles (total). 4. Finish reading All The Money in the World (advance copy that I was asked to write an endorsement blurb for), Quitter, and Friendship for Grownups. I was so blessed and inspired by Dr. Henry Cloud at the Women of Faith conference last week. One of the topics he spoke on was happiness. He shared three keys that much research has shown led to deep happiness. Want to know what they were? Being a giver, having close friends around you, and setting goals. I’ve always known that goal-setting gave me much fulfillment and purpose for living life, but I thought it might just be because I’m rather Type A and all. So it was encouraging to me to know that scientific research backs up what I’ve experienced in real-life meaning goal-setting is not just something that helps Type A folks like me. Whether you’re Type A or Type Z, it will positively impact your life! Note: Since this is a public blog, I won’t be sharing all of my goals (such as my marriage goals, etc. ), so if you’re wondering why it seems a little unbalanced in certain areas, that’s why. 4. Finish reading Good to Great, Quitter, and Raising a Soul Surfer. 6. Make Homemade Scrubbing Bubbles and homemade soap. 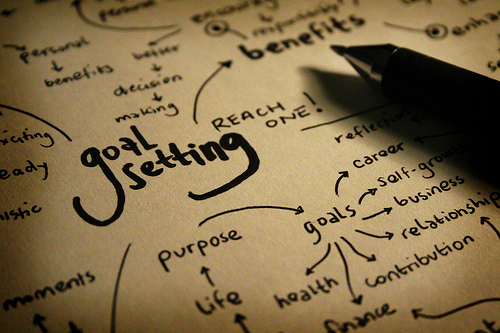 One of the things I stress in my upcoming book is the importance of goal-setting. Not only has setting goals and breaking them down into bite-sized pieces revolutionized our finances, but it has also been hugely beneficial in our personal lives. Before each week begins, I set down and map out goals for the following week in six different categories: Marriage, Mothering, Personal, Home Management, Business, Ministry. While I never actually accomplish every single goal on my list, having a written list gives me purpose, focus, accountability. It’s always encouraging to review the list at the end of week and see what things I accomplished. You know how you have those days and weeks where you feel like you just go around and around in circles cleaning up one mess after another? Well, having written goals to review at the end of the week helps me to see that I actually did something productive during the week! As a way to keep myself accountable and hopefully inspire you to consider implementing weekly goal-setting, too, I’m going to be sharing my list of 10 goals each Monday morning. I’d love to have you participate by sharing your goals in the comments. Next Monday, I’ll post a follow-up post with my progress and will encourage you to share your progress, too! 2. Finish reading Revenge of the Red Knight aloud to the children. 3. Put together Busy Bags for Busy Bag Swap. 4. Run 12 miles (total). 5. Finish reading Good to Great, The Charlotte Mason Companion, and Eat That Frog. 7. Make Homemade Fruit Leather and Homemade Scrubbing Bubbles. 8. Wash, dry, fold, & put away one load of laundry every day (except for Thursday-Saturday when I’m in Indianapolis). 9. Shoot videos and send to publicist. 10. Write two birthday cards, one anniversary card, and one thank you note. Help girls write birthday cards to those who have birthdays this week. What are your goals for this week? If you feel comfortable doing so, I’d love to have you share 5-10 of them in the comments section. And then come back next week to share your progress!